Release 2.0 of Project OpenPTK builds on the success of Release 1.x. The goal ... enable developers to create custom interfaces to a variety of repositories ... has not changed. Release 2.0 gives the developer more choices for how they want to create custom interfaces. Release 2.0 also supports more back-end repositories. The "core" Framework Tier has also been enhanced to include "models", authentication, authorization, pre-actions, post-actions. Release 1.x was a monolithic design. The OpenPTK architecture was "packaged" with the application and deployed as a single unit. This made it difficult and near impossible to separate the OpenPTK Framework and Services from the application and maintain and manage them as separate components from the developers application or client. Web 2.0 Developers are leveraging a variety of tools and languages to build end-user interfaces. Solutions are being built (such as AJAX) which require a standardized mechanism to access information. These types of applications typically use a RESTful Web Service which supports standard JSON/XML data structures. In Release 2.0, OpenPTK's "Server Tier" provides the RESTful Web Service (supporting JSON and XML). The RESTful Web Service offers multiple ways to "represent" the data between the Server and the applications. Bi-directional data can be represented using either JSON or XML syntax. In Release 1.x, OpenPTK's Service architecture is used to define and implement access to a provisioning backing-store (SPML, JNDI, LDAP). A Service provided an implementation of some or all of the OpenPTK Framework "operations" (Create, Read, Update, Delete, ...). All "operations" when to the same backing-store. 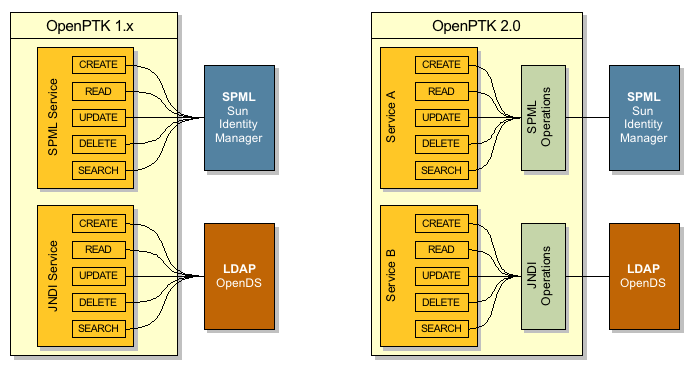 In Release 2.0, OpenPTK's Service architecture separates the definition and implementation of access to the various provisioning backing-stores. A Service can be configured where each Operation could reference a different backing-store. For example, a Service, related to a Context could have its CREATE, UPDATE, and DELETE Operations use SPML, while its READ and SEARCH Operations use JNDI. Release 1.x had little in the way of a Client-side Java API. Release 1.x didn't include authentication to the OpenPTK framework or services. It was up to the implementer to include their own authentication framework. Refer to the detailed design and implementation notes on Release 2.0 Authentication. Refer to the detailed design and implementation notes on Release 2.0 Authorization. Release 1.x didn't include any ability to connect up back end services to one another resulting in a model made up of views and relationships between these services. It was up to the implementor to do create and implement their own connections. Refer to the detailed design and implementation notes on Release 2.0 Models, Views and Relationships. In Release 1.x, OpenPTK was focused on performing basic operations within Contexts such as basic CRUD operations (Create, Read, Update and Delete) and few more around passwords. Outside of performing these basic data tasks, there was no facility to perform other actions, such as sending an email. This simple action is contained as part of the create operation of a context within the OpenPTK config file. The Operation Actions define the notify action. The Plugins define the sendmail and template plugins. Starting with 2.0 the following services will stop being enhanced, tested and included in binary distributions, and are candidates to be removed from the repository at anytime. The code and projects will be left around for example and experimental use going forward. OPENPTK-226 Change the CLI command line binary to "openptk"